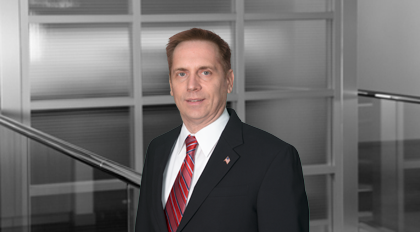 Christopher (Chris) J. Knors, Ph.D.
Dr. Knors advises companies and research institutions with complex legal issues relating to obtaining, protecting, enforcing, and transferring intellectual property. His practice is focused on technologies that involve chemistry, materials, and polymers-- such as pharmaceuticals, agrochemicals, medical devices, glucose monitoring sensors, metals, glasses, and fibers as well as semiconductors, integrated circuits, light emitting diodes, and their manufacturing processes. He has extensive experience with small molecule compounds, compositions, and delivery formulations. His services include patent preparation and prosecution, counseling on patent portfolio management and strategy with issues that include patent validity, infringement, reexamination, post-grant review, design around strategies, licensing, technology acquisitions, and collaborations. Dr. Knors has performed intellectual property due diligence investigations for clients seeking to acquire or market medical devices and early and late stage pharmaceutical product candidates and has assisted clients with technology transfers in the agrochemical, medical device, pharmaceutical, and chemical fields. Dr. Knors’ doctoral research in organic/organometallic chemistry focused on synthesizing, characterizing, and implementing novel organometallic compounds as reagents for natural product synthesis. Conducted due diligence investigations for a plant renovation project involving proprietary fuel gas recycling, representing over one hundred million dollars of investment capital. Conducted due diligence investigations for a joint development between two major medical device manufacturers, representing over ten million dollars of investment capital. Conducted due diligence investigations for generic pharmaceutical and medical device clients seeking pre-market approval. Prepared and obtained patent protection for an emerging agrochemical company’s patent portfolio covering a plant growth regulator. Prepared and obtained patent protection for an emerging pharmaceutical company’s patent portfolio covering an enhanced solubility composition for a small molecule drug. Developed and implemented domestic and international patent portfolio patent strategies for large multinational corporations, start-up chemical and medical device companies, covering a range of technologies. Worked with in-house counsel and university technology transfer personnel on licensing agreements, supply agreements, material transfer agreements, inventorship issues, and trade secret matters. More than 15 years of R&D and management experience with IBM, Exxon, and Becton Dickinson. Inventor or co-inventor on 21 US patents and more than 40 international patent applications. Author or co-author of multiple journal articles in organic, inorganic, and organometallic chemistry, material science and bioengineering disciplines.